Personalized service is a major benefit of banking at EquiShare Credit Union, and you don’t have to sacrifice convenience to get it. Take advantage of EquiShare Credit Union’s shared branching services through CO-OP Shared Branch and you can access your account at any of 5,100 credit union branches nationwide, often just as if you were visiting one of our own. The national CO-OP Shared Branch network links participating credit unions electronically, allowing credit union members to do “branch banking” even when the branch near you doesn’t belong to EquiShare Credit Union. This is a huge benefit to EquiShare Credit Union members who travel, whose workplaces don’t coincide with our branch locations, or who simply enjoy the convenience of expanded access. Wherever you are across the country, chances are good there’s a shared branch near you. Shared branching is yet another example of credit union membership offering the best of both worlds—individualized attention and nationwide availability. The cooperative spirit of credit unions allows them to work with each other in ways that competing banks typically do not. Visit www.co-opsharedbranch.org or download the Shared Branch Locator app for iPhone or Android to find branches nearest you. 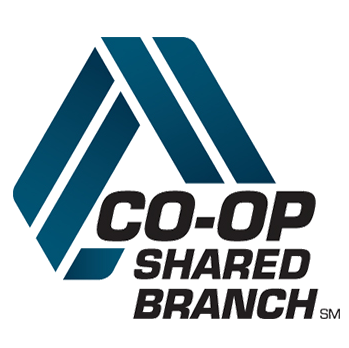 You can also look for the “CO-OP Shared Branch” logo on the door of any credit union branch.